* Coreloft™ 80 (80 g/m²) insulation. Thorium AR Jacket - Mens is rated 4.5 out of 5 by 17. Rated 5 out of 5 by dazdarren from Well made, great fitting down jacket with innovative features The fit of my Thorium is perfect for me. There is a little room in the body to allow for a layer underneath. It pairs well under my Arc' hard shell. I own a few other Arc' pieces and sometimes the sleeves seem too long but not with the Thorium. What particularly impresses me is the breathability of the jacket. For example my Atom LT which I love too heats up when I'm working hard in it and sometimes feels too warm whereas the Thorium in similar conditions seems much more breathable and overall more comfortable. Each jacket has its time and place and I see the Thorium as great add to Arc'teryx' lineup. 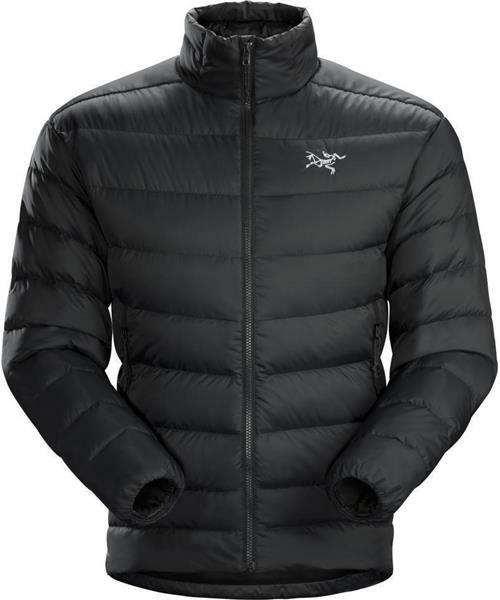 The jacket is well made and feels a step up in terms of look and feel of other down jackets. I'm sure I will be happy and wearing this jacket for years to come. Rated 3 out of 5 by JNG155 from Zipper is not great This jacket looks very nice and is quite warm. Two Minor Complaints: 1. The zipper comes undone very easily. I had my jacket done up about 2/3rds of the way and had it come completely unzipped when hit with a hard gust of wind. 2. The XL fits me nicely around the chest, shoulders and back but the hips/waist is really baggy. It has a waist drawstring so that helps to make it look like a more tailored fit. As Arcteryx shirt/jacket sizes get bigger than a medium they slowly get proportionately larger around the waist vs the chest. From Large to XXL the waist to chest ratio increases more and more. I'm 6' tall, weigh 192lbs with a 44.5" chest and 32.5" waist and the XL is the size that fit me the best. Rated 4 out of 5 by Bongo23 from A triumph of function over form If you are purely after an understated jacket that has excellent thermal properties, with no unnecessary weight- then you should adjust my rating to 5. I think the jacket could be a bit less Spartan however with only a small weight penalty. An inside pocket wouldn't go amiss and I'd much prefer the sleeve cuffs to be less insulated (less puffy) on the lower forearms and wrists. The problem is that unless you have very long arms, the material bunches up over your cuffs- meaning you get your sleeves wet for example when washing your hands. Otherwise the jacket is clearly well put together and well thought out and the warmth to weight ratio is excellent. The jacket has a fantastic weight to warmth ratio and fits the Arcteryx modus operandi of making garments for purists- not posers. Rated 3 out of 5 by RV72 from light and warm but for how long I bought this jacket to go along with a shell jacket for skiing. Great, light jacket, very harm, and blocks some wind. I wore it during a couple of windy days and it was great. However, after just a week of having the jacket, there's lots of feathers coming out of the jacket. At this rate, I wonder how long it will take before all the down is gone. Rated 4 out of 5 by RickinAZ from Great warmth to weight, bad zipper I've had the chance to wear this in the mountains and downtown Chicago, and it has kept me comfortably warm in a wide range of cold temps. However, as another reviewer has mentioned, the main zipper will not stay in place!! Very frustrating in the wind as I was constantly having to pull it back up. Thick underlayers or scarves exacerbate the problem. If arcteryx would simply have a LOCKING ykk zipper, this is 5 stars. I'm 6', 195 and L is perfect. Rated 5 out of 5 by monboolooman from This jacket is an excellent piece of kit This is not a bulky or a typical "puffy coat" it is light weight and can be worn under an outer shell. It was an extremely cold winter in upstate NY this past year and you will be able to wear it as a standalone in sub zero weather. Rated 5 out of 5 by Schwabby from Solid Insulating Jacket I chose the Thorium AR to use as my main base camp piece. It's big enough to keep warm in cold conditions, packs down small enough that it doesn't take up a ton of space and is versatile enough to layer up or wear on its own. I also prefer the larger zippers than what is used on the Cerium's because they are easier to grab with gloves on. Great coat! PS. I also use it in a larger stuff sack to double as the perfect size pillow! Rated 4 out of 5 by Aaron from Good mid/outer layer, but I wish it was longer! Attention to detail and quality are excellent with this jacket. The stitching is extremely tight, and I have yet to have anything go wrong with construction. The 750 fill is adequate between 20-50 F - by adding my Arc'Teryx Beta LT on top, I can easily take this combo down to 0 F. I chose this over the Cerium LT because of the more robust face fabric, waist draw cord, and the added protection behind the main zipper. My only complaint thus far has to do with fit. I am 6'1" 180 lbs. and wear the Medium. The chest and torso fit perfectly, but the sleeves and length seem to be about 1 inch too short. From what I understand, the jacket length was made shorter to accommodate a climbing harness. That being said, perhaps it would be ideal make the Cerium LT harness compatible (since it is marketed more for alpine-use), and keep the Thorium AR a bit longer (since it is marketed more as an all-around jacket). I should also note that I do not have this problem with other manufactures (TNF, Patagonia, etc. ), although I like to stick with Arc'Teryx because I think the quality is much better. Overall, the Thorium AR is an excellent jacket for alpine and urban use. For me, it would be PERFECT if the sleeves and overall length were one inch longer. A slightly taller collar would be a welcomed addition, as well.